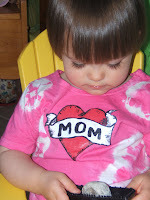 I have always been 'crafty' ~ I have wonderful memories of crafting with my grandmother at an early age. Cool yarn octopuses (octopi?) and balloons covered in glued string come to mind! When my mother gave me her old Singer sewing machine at age 21 I taught myself to sew and that old beater is still my favourite machine. Knitting, painting, cross stitching, quilting have all had their turn and I have turned out many a handmade gift! For several years Andy and I had a small business doing dog collars, beds and other doggie stuff. Having a child seriously cut into time and energy for creative output but I a m enjoying having a little more time, now (and the enjoying the child even more, anyway!). 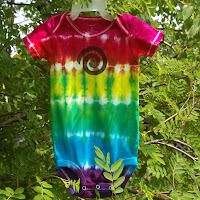 I have tie dyed over the years, but I am really getting a kick out of it now! The 'real' dyes make a world of difference and I am working on my technique and developing some distinctive styles of my own. I am also permanently dyed ~ Andy thought I was bleeding tonight ~ just fuschia dye! The painting the tees is just fun! 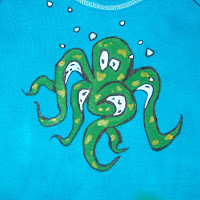 Picking cute, cool and catchy designs that complement the dye work and watching them take shape and bring joy is a blast and the custom work keeps expanding my abilities and humbling me, too (once you touch that brush to the shirt, you are committed! ).